Yuexiu District is a district in Guangzhou; it has been playing an important role in Guangzhou since ancient times. It was the base of Cantonese culture development; the commercial center and the administration center of Guangzhou in the old days. These unique elements make Yuexiu District an irreplaceable district in Guangzhou. Yuexiu District is located in the central axis of Guangzhou; it lies to the east of Guangzhou Avenue near Tianhe District; to the south of Pearl River facing Haizhu District; to the west of Renmin Road next to Liwan District; and to the north of Baiyun Mountain beside Baiyun District. Yuexiu District covers the total area of 33.80 square kilometers, and it is the district with the highest population density among the 13 municipal districts in Guangzhou. What’s more, Dongshan District merged with Yuexiu District and became one district in 2005. The popular saying at the time “Gentleman in Dongshan and lady in Xiguan” well illustrated the distinctive features of Yuexiu District. Nowadays, the existing western style buildings in Dongshan are worthy visiting. With the abundant resources, Yuexiu District is able to discover and remain the historic heritage of the “Beijing Road Ancient Avenue” with thousands of year’s of history. All in all, Yuexiu District is not only suitable for living, but also a good place for commercial business tradings. The street names of Yuexiu District are quite special. Just take a few for example: in the east there is a Dadong Gate Road which in Chinese means “large east gate”; in the west there is a Ximenkou Road which in Chinese means “west gate”; in the south there is a Danan Road which in Chinese means “large south road”; in the north there is a Xiaobei Road which in Chinese means “small north road”. Each street name has its unique symbolic meaning based on the history of Guangzhou (Canton), so it will be quite an interesting trip to take to discover the stories behind the street names in Guangzhou City. Yuexiu District is a place full of traditional Cantonese culture because it inherited the thousand years’ distinctive history of Guangzhou; the Spring Festival Flower Market is one of the most eye-catching events held in the city each year. The Yuexiu Flower Market in West Lake Road is an exceptional creative flower market in Guangzhou, there are a lot of traditional elements in it yet new innovative ideas are added year after year. The Xihu (west lake) CNY flower market in Yuexiu District arouses many people’s interest in participating in the flower market activities; more importantly, the government has some policies to support the development of the Yuexiu Xihu flower market so that it may continue to prosper. One thing is to register an official trademark for the “Yuexiu West Lake Flower Market” so as to protect the flower market branding. Another way to promote the Yuexiu Flower Market is to host the International Floral Cultural Forum where “King of the flower” will be selected in each year’s competition. These all show that Yuexiu Xihu Flower Market is the pioneer of flower markets in Guangzhou. Guangzhou is a city of traditional culture and acceptance. 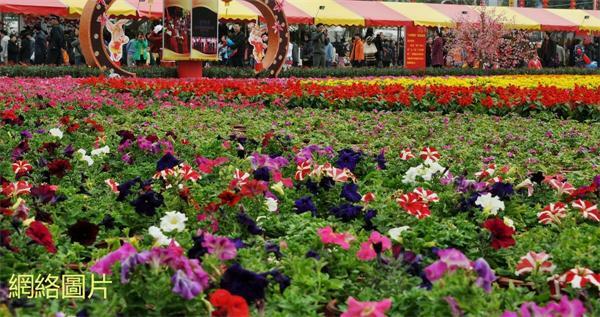 Whether you are a local Cantonese or a foreigner visiting Guangzhou city, the Spring Festival is a good time to bring friends and families to enjoy the traditional Yuexiu West Lake CNY Flower Market to experience the local joyful atmosphere. During Chinese New Year, almost all the local Cantonese will buy some flowers or CNY potted plants with symbolic well meanings, for example, orchids, peach blossoms, silver willows as well as kumquats are all essential CNY festive plants for the local families. It is said that the CNY flowers and plants with good meanings will bring people fortune and hope for prosperity in the up-coming New Year. The opening hour of Yuexiu District Xihu Spring Festival Flower Market: Lunar Calendar: 28th of December to 1st January from 8:30 to 24:00. Location of West Lake Flower Market in Yuexiu District: West Lake (Xihu) Road, Education (Jiaoyu) Road. The Metro guide of Yuexiu District Xihu CNY Flower Market: Guangzhou Metro: Line 1 and Line 2, get off at Gongyuanqian Station. Public buses: Qiyi Road Stop, Jiaoyu South Road Stop, Zhongshan 5th Road Stop. This is a Hong Kong GGB original 'City of Flower- Yuexiu District, Guangzhou' blogpost.